Are Kandy Perahera's time honoured traditions in jeopardy? 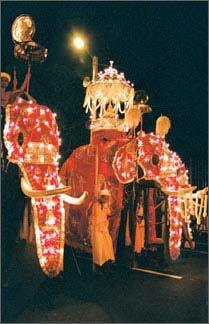 The glittering Esala Perahera, which is 235 years old, is one of the grandest events we have in Sri Lanka. Many locals and foreigners look forward to witness this wonderful festival every year. This is held during the Esala month, in August, honouring the sacred tooth relic. Many foreigners who have been fascinated by the Perahera have written notes about it; among them is the famous British poet and novelist, D. H. Lawrence, who describes the Perahera as a "perpetual fire-laughing motion among the slow shuffle of elephants." Fa-Hien, one of the famous Chinese monks who arrived in Sri Lanka on a pilgrimage in the fifth century A.D. also gives a full description about the Perahera in his book, Fa-Hien Travel Records. "By the side of the King's Palace is the Vihara of the Buddha's Tooth, several hundred feet high, brilliant with jewellers and ornamented with rare gems. Above the Vihara is placed an upright pole on which is fixed a great Padmaraja (ruby). The Tooth of the Buddha was always brought forth in the middle of the third month. Ten days in advance, the king magnificently caparisoned a large elephant. A man dressed in royal robes on this elephant, who could speak distinctly, and the man went round it, beating a large drum, describing the life and the virtues of the Buddha, and announcing to the public; "Behold, ten days after this, Buddha's Tooth will be brought forth, and taken to the Abhayagiri Vihara. Let all, whether monks or laymen, who wish to amass merit for themselves, make the road smooth and in good condition, grandly adorn lanes and by-ways, and provide an abundant store of flowers and incense to be used as offerings to it." When this announcement was over, the king placed for exhibition on both sides of the road, the 500 different bodily forms in which the Buddha had appeared in his previous births according to the Jataka stories. All their figures were brightly coloured and grandly executed, looking as if they were alive. After this, the Tooth of the Buddha was brought forth, and was carried along in the middle of the road. Everywhere on the way, offerings were presented to it, and thus it arrived at the hall of the Buddha in the Abhayagiri Vihara. There the monks and the laity gathered in crowds, burned incense, lighted lamps and performed all the prescribed services, day and night, without ceasing till 90 days had been completed until the Tooth was returned to the Vihara. On Poya Days, the doors of the Vihara were opened, and forms of ceremonial reverence were observed according to the rules. 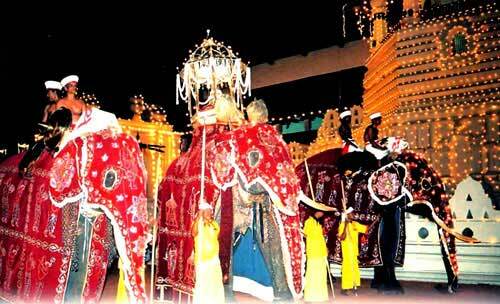 Even during the Kandyan era between 1739 and 1815, the Esala Perahera was given much prominence. Four Devale Perahera, which was dedicated to the four guardian deities, Natha, Vishnu, Kataragama, and Pattini, was merged to the main Perahera during the Keerthi Sri Rajasingha Era. The Perahera is held according to some rituals coming down from traditions. They are known as ‘Esala-keliya'. This festival begins with the installation of ‘kapa' in each Devale. According to the ritual, for five days after installation of kapa, the kapuralas of each devale take it around every evening in a procession, accompanied by music and drumming and along with flag and canopy bearers and spearmen, and the sacred emblem of the gods.' This is known as the Devale Perahera. The Randoli Perahera begins on the 5th day. This is a lengthened version of the famous Kumbal Perahera. Palanquins of the four Devales which contains ornaments of the goddess, pitcher, and the sword are added to the Randoli Perahera. On the full moon day, this Perahera reassembles to go to Asgiriya temple, where the casket is placed. Then Devale Peraheras return to their Devales. Again, in the night, the Devale Peraheras make their way to the water-cutting site at the Getambetota. At the river, the ‘kapuralas' of the devales, go in a decorated boat, to some distance in the river. At this place, each ‘kapurala' slashes the water with the sacred sword and collects a pitcher full at the place where the sword touched the water. This water will be stored in their Devale for one year, and will be put back into the river, next year at a similar Ceremony. After seven days from the day Perahara, the ‘Waliyak-netuma', a shortened form of ‘Kohomba-kankariya' is performed at the Vishnu devalaya, along with masked dancing. On the seventh day, the Esala festival will be declared as over. The people of the ‘balibat' caste, who are sorcerers and exorcists, were the dancers in the Perahera during the days of our kings. It was a form of ‘Rajakariya' (duty) to the king. This time the Kandy Esala Perahera will be held in a grand style and will be a testament that Sri Lanka is ready for tourism after the peace!